The biblical story of the young David slaying the Philistine giant Goliath with a stone from his sling served as a heroic inspiration for many Renaissance artists. The three Davids, separated by sixty years, from Donatello's David, on to Verrocchio's version, and finally to Michelangelo's marble incarnation, highlights the popularity of David as an artistic subject. 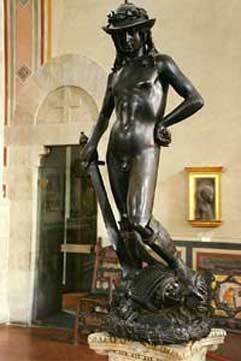 Donatello's David was a great hit when it was first unveiled in the 1440s. 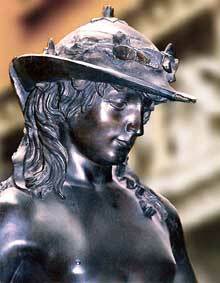 It was the first unsupported work to be cast in bronze of the Renaissance era. The statue's nakedness and implied homosexuality, with David, clad in no more than boots and a hat made this work very controversial at the time. 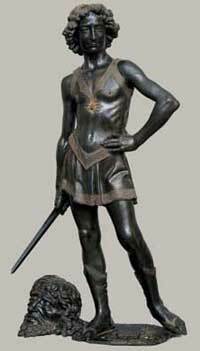 Some historians have questioned if this statue does depict David, and suggest that the helmet is more reminiscent of the Greek or Roman messenger gods, Hermes or Mercury. 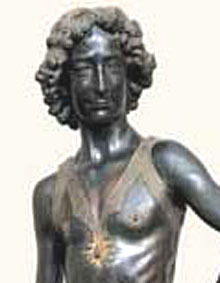 Verrocchio's David was commissioned by the Medici family, and popular legend states that the model for the statue was a young artist from Verrocchio's studio, Leonardo da Vinci. The placement of Goliath's head has been the subject of debate. 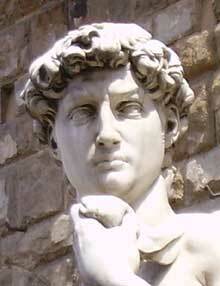 Some historians say that the head should be placed between David's feet while others claim that it belongs to the right. The statue has been exhibited using both placements. 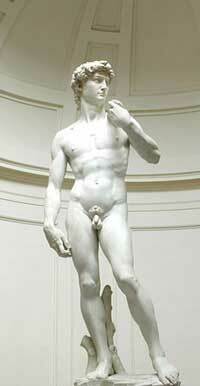 A 17ft masterpiece carved from the finest marble from a quarry in Carrara, this is Michelangelo's David. The artist was only twenty-six years old when he was given the commission and he worked on the statue for over two years. This David does not include the head of Goliath, as in the works by Donatello and Verrocchio, but depicts the moments before (or after) the battle with the slingshot placed over the left shoulder. A committee of artists, including Botticelli and Leonardo da Vinci, met and decided that the statue should be situated at the entrance to the Palazzo Vecchio on the Piazza della Signoria in Florence. The original sculpture is now in the Accademia Gallery in Florence. The David in the Piazza della Signoria is a replica.